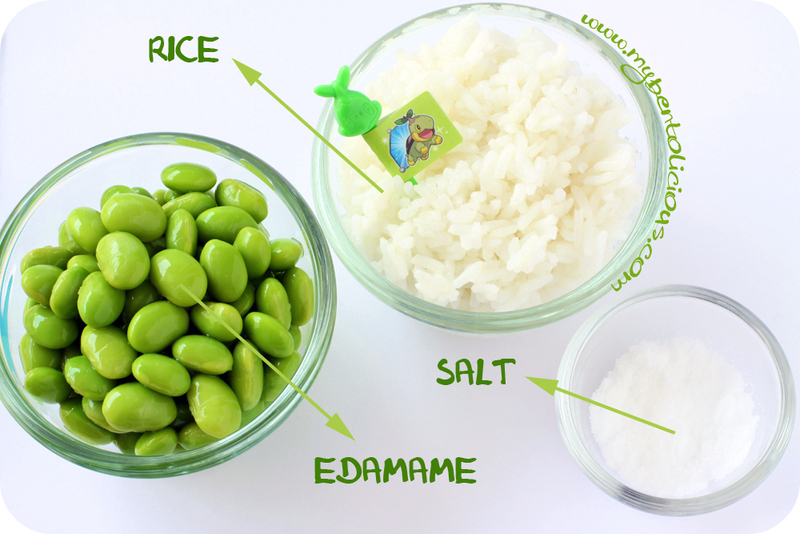 As promised, I post this pictorial tips for making edamame rice. The steps are pretty simple and do not take a long time to turn your regular rice into green healthy rice. The ingredients are just rice, edamame, and salt. Edamame rice taste nice and no strong odor, it just like regular rice except we can taste the edamame at the same time. (1) Lightly boiled the edamame in the water (you can choose to salt the water if you want) for about 5-6 minutes, after that drain and remove the edamame from the hulls. Then put them inside the cold water. (2) Remove the soft skin so you can get the smooth edamame paste later by pinching the edamame softly with your thumb and point finger. As shown on the picture above, you can see the floating ones are the soft skin. (3) After that throw away the hulls and drain the clean edamame. 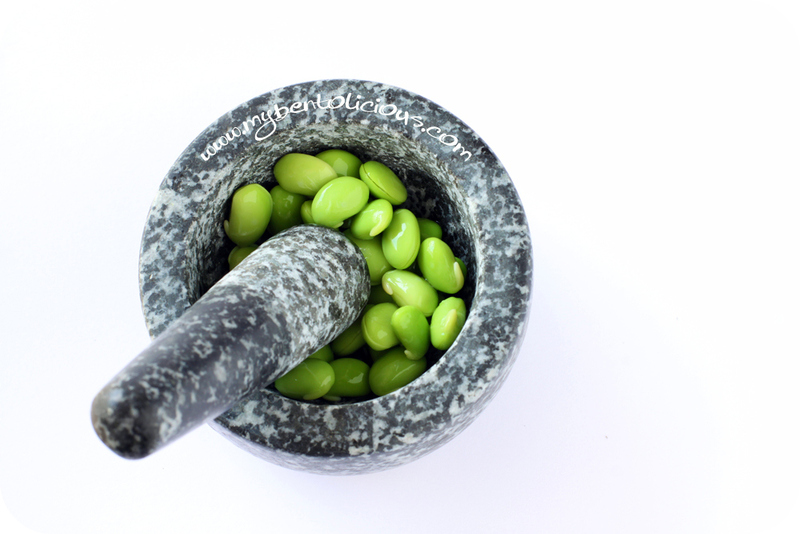 Use stone mortar and pestle to grind the edamame until smooth and even. I use stone mortar and pestle because is electricity saving and easy to clean. If you don't have it, you can just use the blender / food processor too. But you might need to add a little bit of water if you use blender / food processor. 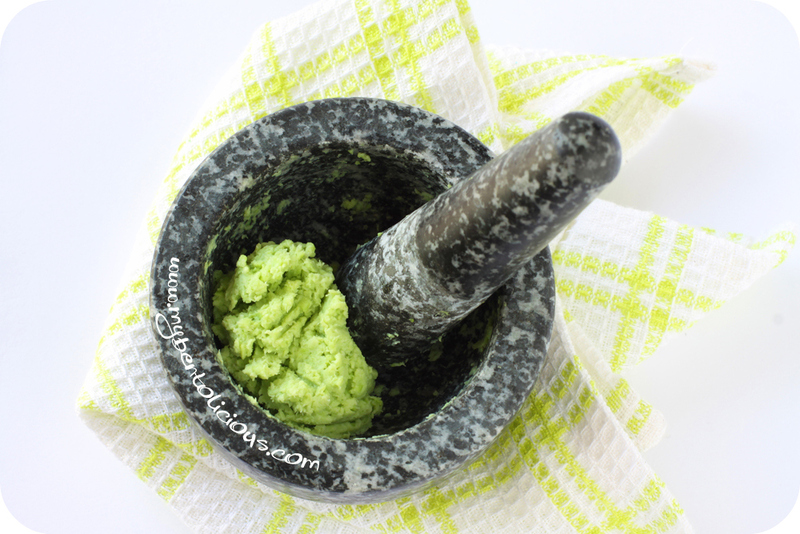 (4) The picture above show the edamame paste, looks like wasabi. (5) Mixed the rice with edamame paste with a small amount first, you can add some more later if you like in the process. 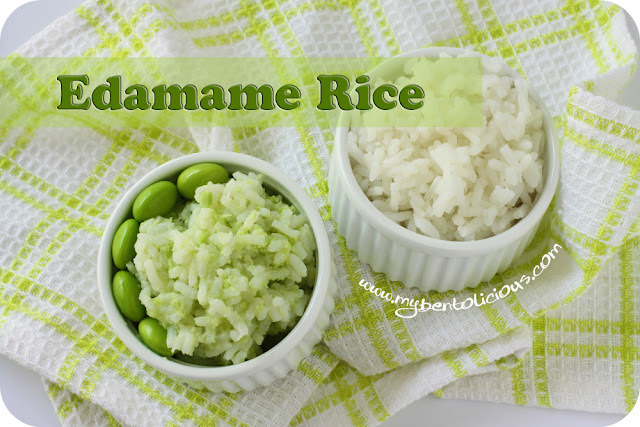 And you can sprinkle some salt too when mixing the rice and edamame, so the edamame rice has a little bit of salty taste. Hope this tips is useful for everyone! Hi Lia, I had chanced upon your blog last week and that had led on to other bentoblogs and now I'm hooked! Love what u gals are doing. I got a question. I read that sometimes an uncooked spaghetti 'stick' is used to hold things together eg ears of dogs etc. Does that bother the child who's eating it? (my boy is 3, so am afraid he might choke on it) thanks! Hope to hop on the bentoblogging bandwagon soon! Thanks for the tutorial Lia! You make it look so easy. I have a mortar and pestle and hardly every use it. Now I have a reason to dust it off! Thanks for sharing Lia. I'll definitely try that soon! Never thought of making endamame rice and that sounds yummy! 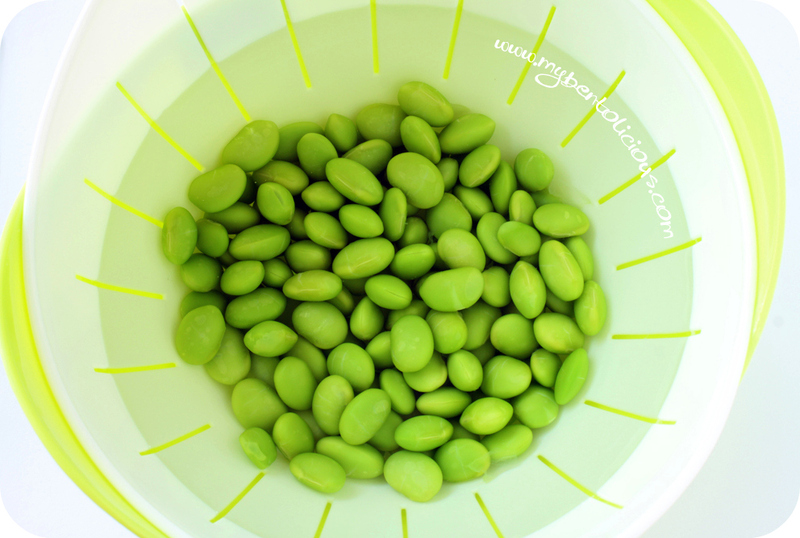 Both my girls love Edamame so they might really love this, thanks for sharing, awesome pics! Thanks for the very helpful recipe! 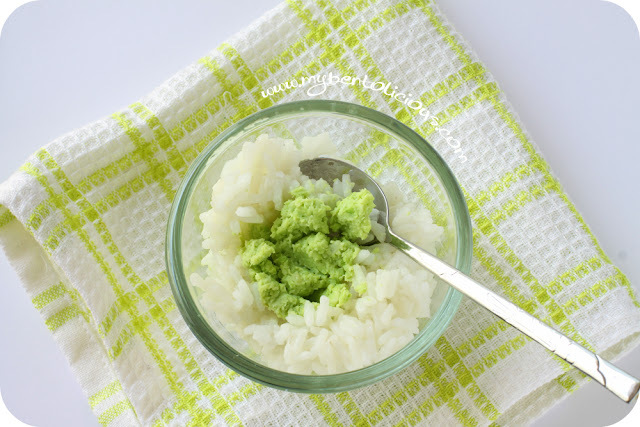 I like to use an edamame paste for sweet dumplings but wanna try cute green onigiri sometime! Wow, that looks tasty, healthy, and beautiful! Thank you so much for posting the instructions. I think I'm going to have to try it this weekend! hi lia, thanks for the tip. maybe my fussy eaters will try it if i mix them up this way! Fantastic tutorial Lia!!! Your rice looks perfect! Great instructions - thanks for showing us! Yum, love the radiant light green effect of the edamame...lovely tutorial Lia. Your posts always create such a light-filled and refined aspect to bento and cooking...so uplifting every time I visit! 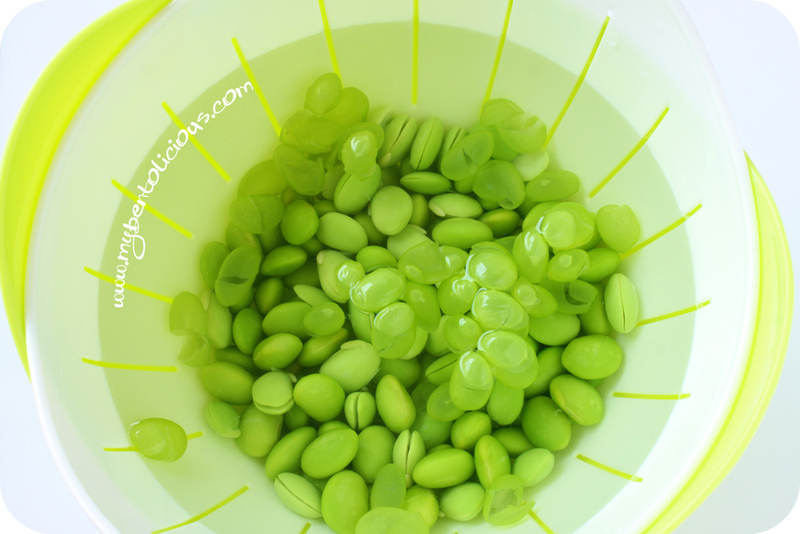 love your idea for edamame rice, always fun to have colored rice for molding, plus the edamame adds a healthy benefit! @mrsmultitasker.com : Thanks a lot! can we use others vegetable or bean to coloring rice green?